August | 2013 | 365 days of letters, notes, and written words. Today I want to tell you about 26 things I am thankful for… in no particular order. 1. I am thankful for air conditioning so powerful that I need to wear my comfy sweater at work. 3. More importantly, for friends. The kind that inspire me to live life better and give love better. 4. For that feeling you get in the movie theater when the lights go down. 5. For rainy days, where everything smells like dirt, but in the best way. 6. For family. In particular, my family, who has always surrounded me with love without ruining me with it. 7. For books that transport me, and make me laugh and cry and want to do completely crazy things. 8. I’m thankful for this new shirt I got today that plays sound effects. I’m sure my brother already regrets getting it for me, but I’ve been walking around for the past hour to applause. And I finally have my own laugh track. 9. I’m thankful for a job that doesn’t make me feel like my soul is sucked out of me. In fact, when my job is busy and I’m needed, my job makes me feel like more of myself. And that is a rare and wonderful blessing. 10. I’m thankful for the time to get to know my junior high small group, and the trust they give me even when I’m too tired to think I deserve it. 12. For early mornings when the light slants just right. 13. For deep cups of coffee. 15. I’m thankful for long-distance friends. If someone loves you enough to stick with you across state lines, they’re a keeper. 16. For NPR, and the way it makes the news fascinating, and how it celebrates the power of stories. 17. For Hollins, and this summer, and all of the glorious people I met there. 18. For tea: hot and iced and dark and green and peach and cinnamon. Just not all at once. 19. For the genius that is John Green. Just finished Will Grayson Will Grayson again today and can barely function. 20. For movie marathons and popcorn. 21. I’m thankful for the enduring comfort of pajama pants, and only wish they were socially acceptable to wear out. 22. For letters and emails and text messages; “checking in” and “thinking of you,” for moments of shared humor shared experience and shared life. 23. For superheroes, living and imaginary. 24. For the power and influence of community in my life, and for how Willow has helped me build that and celebrate it. 26. For the unimaginable and incomprehensible blessing of living on this earth, loved by all of you, for 26 most beautiful years. Shauna Niequist, one of my favorite people, spoke at church last night about the stories that define us. She reminded us that not all of the stories we tell ourselves are true, and that it’s easy to find ourselves broken by words that should have been resolved long ago. Today in my small group we came back to that and went around in a circle sharing a story that has or does define us. Sharing stories is difficult. Life is so big and varied and nuanced that telling your ‘story’ seems to flatten your experiences into something like a cardboard cut-out of your life. It shares your likeness, but doesn’t compare to the original. I’ve been working lately on how best to share my story, and what I’ve discovered is that I don’t have a story. I have stories. I have threads running through my life of common experiences and themes and patterns that clearly show God’s work, and I can choose which thread to highlight. Usually I think I tell the story of how I’m sick. But tonight and lately I’ve thought more about those moments in childhood that you’d rather forget. So I shared tonight a different thread, one that is woven into the fabric of who I am today in a huge way. I remember elementary school as the first time I felt socially ostracized. I struggled to make friends and found myself sitting alone with a book at recess. That trend continued throughout junior high and pieces of high school. But the thing that stayed with me wasn’t that I was awkward or lonely, although I was, and that loneliness would floor me sometimes. Thinking back on those years, I remember instead how brutal kids could be, and how supervising adults would choose to ignore it. These words that kids threw at me made me feel less, and broken, and other. But here’s the thing. These years were absolutely terrible, and I’d rather live through the sicknesses and surgeries all over again than deal with the hate of other people. I spent years feeling less than other people, and still deal with fear today. Fear of new things or social situations or strangers laughing a few feet away (thinking of course, of course it’s me they are laughing at), but God has used all this. I’m a person now who sees outsiders. When I work with kids, my favorites are always the ones on the edges. I love, deeply, the weird and the quirky. My story touches the stories of others. I am able to be an adult that sees hurt and pain instead of looking away from it, and I think about how an adult like that could have changed my story much earlier. Shauna asked us to think about a word to represent our story, to represent the release of the lies that have been whispered in the back of our minds. A reminder of what our story should look like. I think my word would be enough. I am enough. And that is something I need to be reminded of almost daily. We have been challenged to not only identify the stories and truth in ourselves, but in the people we love. I want to write letters this week sharing those words, reminding them like I need to be reminded, that they are strong. They are loved. They are extraordinary and known and enough. In church on Sunday, we learned again the importance of community through hearing someone’s story. I am reminded, constantly and consistently, of the utter necessity of community in my life, even in moments when I feel cranky or intentionally lonely, in times when I am sulky or feeling other. Even in my best days, when the light is shining just right, even in these potentially gorgeous moments I have the potential to find myself courting impatience. Sometimes I can feel like I’m standing still, watching everything go on around me. And again and again God uses people and community to gently remind me to live, and live well; to be a part of everything around me with all that I can muster. 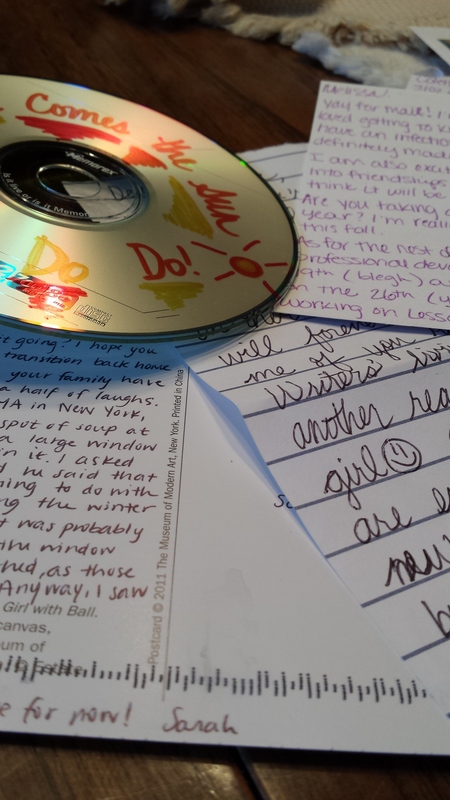 I found letters in my mailbox today, from three different states and including two mix tapes. Letters with encouragements and love and greetings and moments of great wit. Handwriting ranging from tiny to purple to sprawling cursive. And I think it’s no coincidence that community is found again today. And I think of my grandma, whose gift of fostering community is sorely missed in my life, and how I thankful I am for each stamp, each hug, each encouraging word from a friend. God speaks to me in uncomfortable silences. He speaks to me when he pushes me to go, go. Get out of that safe place. Get away from what you know. And he speaks to me in the comfort and embrace of community.